Sandra Bland dashcam footage doesn't show kick or other attack, family rep says. 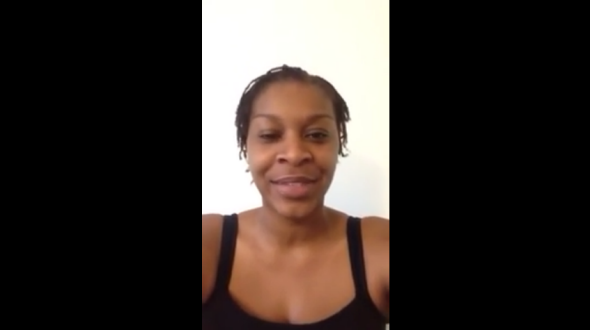 Sandra Bland in a Facebook video. At a news conference, [Jamal] Bryant, a pastor at the Empowerment Temple AME Church in Baltimore, said the footage, which had been shown to Bland’s relatives and their lawyer, but which has not yet been released publicly, showed the DPS trooper stopping her, walking to her car, and then speaking to her while she smoked a cigarette … “You can’t see at any point where Bland attacks the officer,” Bryant said. The Chronicle does note that the entire encounter between Bland and the officer is not shown on the dashcam footage, though it’s not clear whether that means the camera shut off before the end of the incident or simply that some of their interaction took place outside the camera frame. Other footage of Bland’s arrest—shot by a bystander—begins as she is being subdued and complaining that the two officers above her had slammed her to the ground.